Do not miss another Brown Bag Clothing voucher! 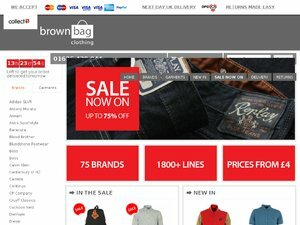 Simply leave your e-mail address and we'll always keep you informed of new vouchers for Brown Bag Clothing. Offer condition: This excludes 3 for 2 and warehouse clearance. Offer condition: Navy, black, white only. Offer condition: Grey, black, white only. Offer condition: Except Dapper Stag. Offer condition: Excludes warehouse clearance and Dapper Stag. Offer condition: Plus free delivery on orders over £50. Available until 10am May 5th. Latest voucher code valid at a time of promo publication was entered to be working from 2016-12-22.